While the International Disc Golf Center’s W.R. Jackson Memorial Disc Golf Course serves as the PDGA Professional Disc Golf World Championships’ known commodity, a mystery lies roughly an hour southwest of the governing body’s headquarters at a venue that is at home trafficking in secrecy. Fort Gordon is a U.S. Army installment in Augusta, Georgia, that houses the Cyber Center of Excellence and an outpost of the National Security Agency. It is also home to two disc golf facilities, including the newly constructed, championship level Marine/Navy Course that will host play to both the second and final rounds of this week’s Pro Worlds. A 10,057-foot, par 68 behemoth, it remains relatively untested, with this week being its debut in a premier event. Designed by James Meek, who also put his touch on Fort Gordon’s more am-friendly Army course, the venue was enhanced for Worlds by John Houck, the veteran design wizard who also crafted the Jackson course. 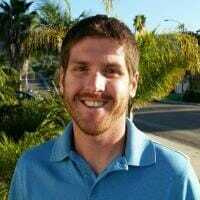 In its former life, Marine/Navy’s front nine housed a nine-hole golf course, Worlds Tournament Director Zach Shafer said, lending it a more spacious feel. That all changes on the back half, though, where tight woods and elevation provide plenty of punishment. Indeed, the course has two holes that surpass two-tenths of a mile in length and closes out with a par 5, 1004-foot doozy. Those open bombers suit a player like Eagle McMahon, who said the course would provide the separation needed to crown a world champion. Still, anyone getting the impression that Fort Gordon resembles any of the open, golf-style courses of recent upper echelon events should take heart. The first hole requires players to hit a gap in the woods before entering the open field, for example, with hole 4 requiring a similar approach. 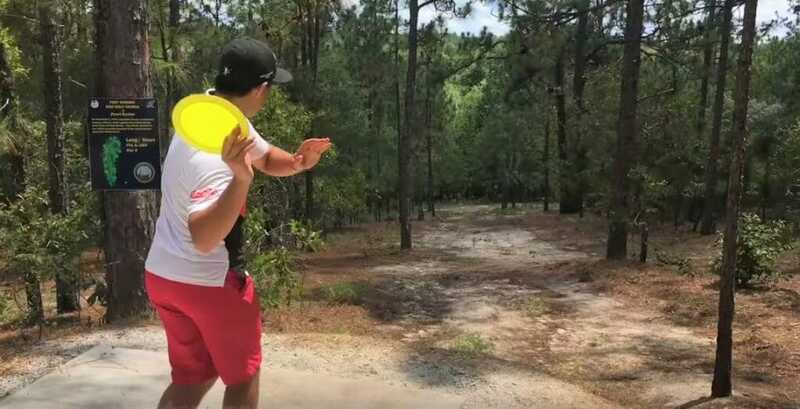 And both Ricky Wysocki and Paul McBeth, the latter of whom is shown below in some recent practice round footage at Fort Gordon, pointed to the course it shares the spotlight with this week as its closest comparable. “It’s a little bit more open than W.R. Jackson, but you still have to have really good control, because if you get off the fairways you’re pretty swamped in the garbage to the sides,” McBeth said. Many of those placement shots come into play on the back half, which features some of the course’s signature features. Hole 11, a 704-foot par 4, just screams “disc golf!” with a wooded, left-to-right sloping corridor yielding to a creekside basket. Hole 13, meanwhile, brings in more elevation, its downhill tee shot rewarding the dead stop of a thumber. And with multiple pins perched on hillsides or other embankments, rollaways are always a danger. And while the course is meant to instill trepidation in all those who tread upon it, nothing quite compares to the scare Shafer got a couple weeks ago, when an intelligence leak related to the ongoing investigation into Russia’s interference in the 2016 election was traced back to a contractor at Fort Gordon’s NSA hub. For a brief minute, Shafer was concerned that six months of work finessing not only the course construction, but also the various entry procedures needed to get on base, were in jeopardy. That’s obviously good news for McMahon, who said the combination of terrain and heat made the course remind him of Australia, where he took second place earlier this year at the Aussie Open. And it could play even better for McBeth, who compared Fort Gordon to a much closer, but possibly more personally significant, locale. And as McBeth aims to get back on the world championship horse this season and pick up his fifth title, a throwback to the city where he won his first title certainly provides some comfort. 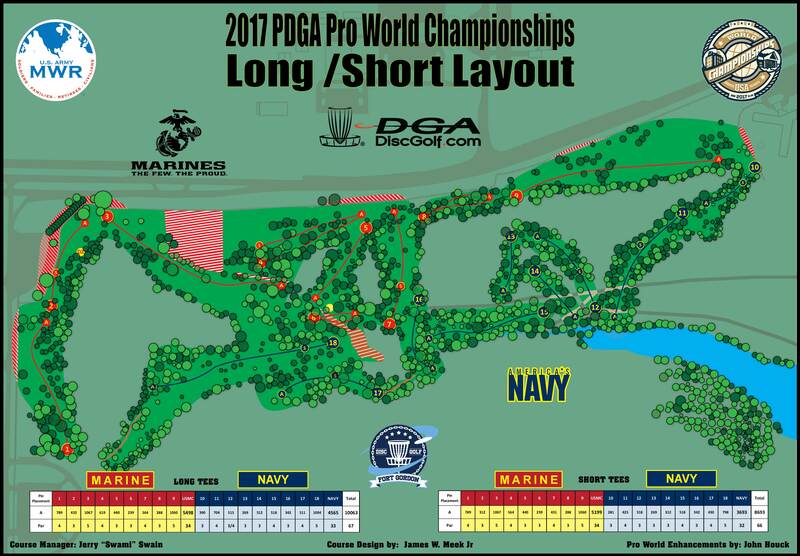 Comments on "Pro Worlds Course Preview: Fort Gordon Marine/Navy"